We understand the needs of owner-operator van owners and transport managers as we have been helping them for many years. Whether you are a full time transport manager responsible for a large fleet of vans and equipment, or an owner-director with transport management responsibility, we can help. We can offer a fast turnaround of vehicles, minimising your downtime costs. Contact us to explore how we can help you keep on top of your fleet maintenance challenges. We will keep and maintain service history records and inspection sheets to comply with VOSA PMI requirements. We will pro-actively keep you informed of which vehicles need servicing (and when) to make sure your fleet stays compliant. As a one man owner-operator or the owner of a business with just one van, we know how vital it is that your van stays on the road. 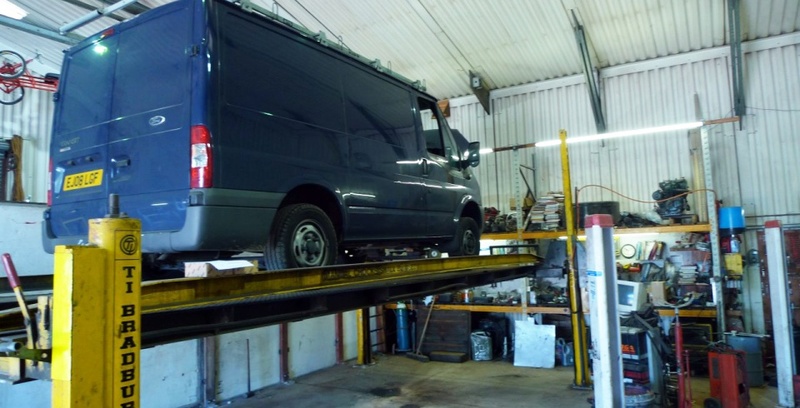 We can offer a personal fast turnaround service for keeping your van in tip top roadworthy condition. Our facility is purpose built for maintaining larger vehicles. TI Bradbury ramp for vehicles up to 7.5 tonnes. Istobal Ramp for vehicles up to 3200kg. 2 post car ramp for cars up to 2 tonnes. High roof workshop capable of handling hightop transits and large lorries. Electronic Diagnostic Equipment - including Snapon Solus Pro fault code scanner. DGA Exhaust gas analyser for pre-MOT checks. Genuine OE parts used to maintain warranties on newer vehicles. After market parts for cost effective maintenance of older vehicles. A G C Welding and Steel Fabrication Ltd.
Aerial and Handling Services Ltd.
"Our vehicle fleet of 15 lorries and vans together with 4 cars have been serviced and maintained by Betchworth Garage for over ten years. Their standard of work, systems and turn round have always been reliable and charges very competitive."